Congratulations to Simone Gilbert for winning this week’s Steampunk’d challenge. We love that you won for a theme that you previously weren’t a fan of! 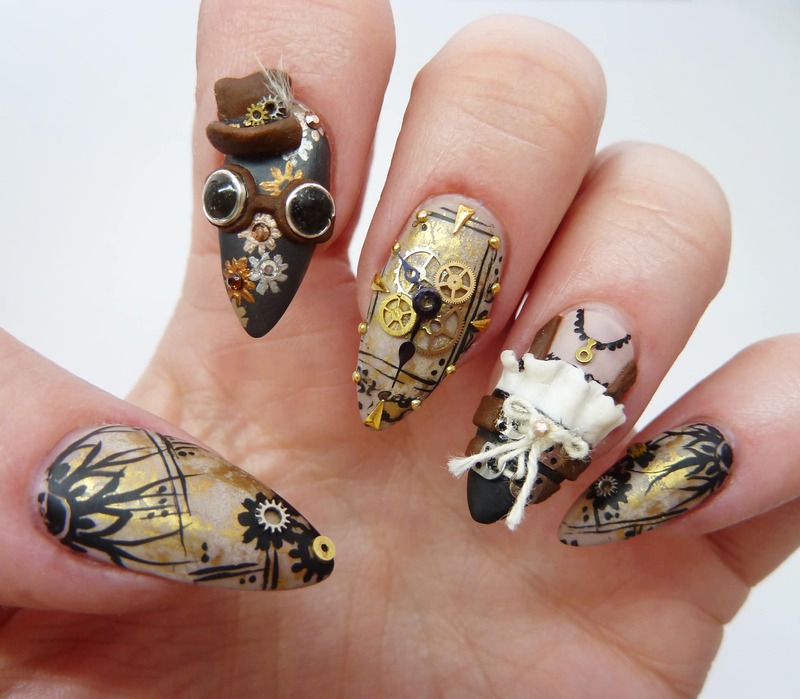 These nails manage to depict the steampunk style with elegance. Your design had amazing balance of handpainted, sculpted, and embellished techniques. It was flawless and crisp and beautiful. The statement pieces (top hat and goggles and the corset) popped, but not too much to make it so this isn’t a wearable design. Watching you work is like watching someone create art. We love your aesthetic. And you are a very talented artist with lots of little tricks up your sleeve to create such cool designs. We think your talent is taking something far-fetched and abstract and making it wearable and refined. Read more comments about Simone’s winning look in our Top 3 & Bottom 3 article. The nail tech who is packing up her paintbrushes this week is…Sherri Traweek. Sherri, we love your quirky personality and you were so much fun throughout this competition. We appreciated how you approached every challenge seriously, while still finding the joy and humor in it. You have a unique point of view and are a very skilled nail artist. We were wowed by your aesthetic and design sense. You have a definite Sherri-style to your nails…we’d know your designs anywhere. We loved having you in the Top 6 and you should be proud to have made it halfway through the competition. We look forward to so much more from you in the months and years to come. This won’t be the last time you hear from Sherri. She will move on to CND’s Last Chance Design Lab where she’ll have one last chance to stay in the competition. Check back next Friday to see who will move on in our Last Chance battle — Lini or Sherri. Tune in Monday to find out the Week 8 Challenge and vote for your favorites! Good luck to Danielle, Lauren, Lavette, Lexi, and Simone, who will all continue in the competition.